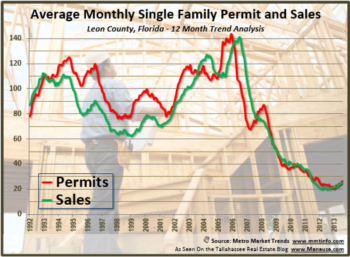 Will The New Home Construction Tallahassee Market Crash In 2018? Recently a long-time reader raised a concern about the growing number of new homes for sale in Tallahassee. He lived here during the build-up stage of the housing market, and he (like many of us) was devastated when the bubble burst. Now he wants to know if we are heading towards another housing market collapse. Fortunately, I have an answer for that below (as well as all the new construction listings in Tallahassee). If you look at the graph above, it shows the one-year trend of new home permits versus new home sales. The permits are shown in red, while the sales are shown in green. We measure permits and sales in order to see when things are about to change. What we want to see is permits and sales numbers that are very close together and moving in the same direction. This typically means that builders are selling all the new homes in Tallahassee that they are building and (generally speaking), things are good and the market is healthy. What we DO NOT want to see is the red line moving significantly higher than the green line (new home permits far outpacing new home sales). Examples of this can be seen in in 1994, 1998, 2002, 2005, and 2008. When this does occur, we want to see how the market handles the excess glut of new homes. For those of you with good memories of ten years ago, you know that many of those new homes were sold by banks, not by builders! So take a close look at the graph above, you'll see EXACTLY what we want to see in a vibrant, healthy market. 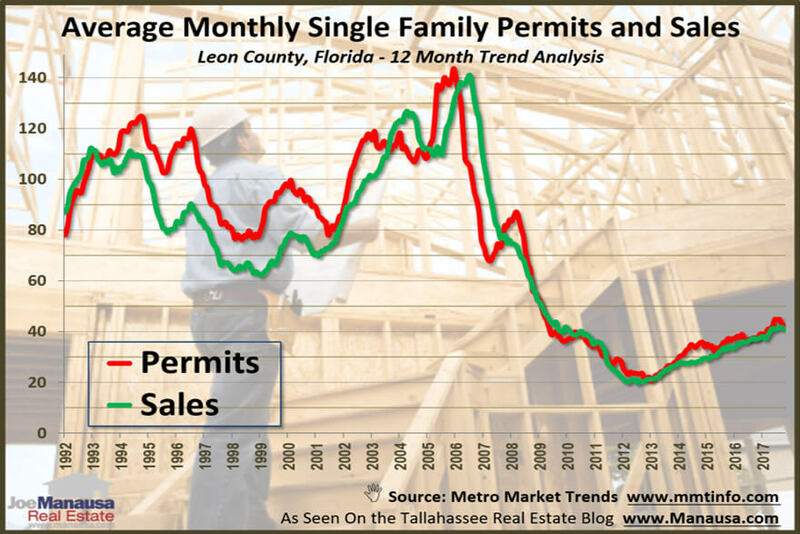 Permitted homes are getting sold, and there is no indication that we are over-building in Tallahassee. Furthermore, if you read all the reports that we publish, then you also are aware of the inventory shortage right now. This means that builders can expect demand to RISE in 2018. So my short answer to our long-time reader is "No, there will be no crash of the housing market in 2018." 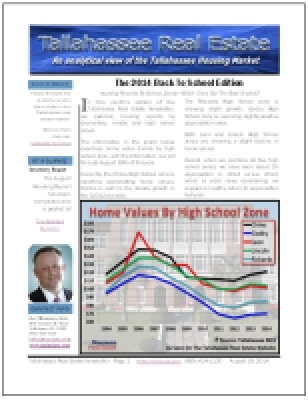 We keep a very close eye on the housing market in Tallahassee. If you would like to see recent reports, there are some great resources that we provide. The best answer is to sit down with a home-buying specialist and let him or her know about your lifestyle, where you like to work and play, and what you need from your home. We can guide you through all the used and new homes for sale in Tallahassee (as well as "coming soon" homes that will soon be available), and if none of those properties work for you, we can introduce you to custom builders who can provide an understanding of what your budget will yield. The key is to exhaust the existing market first, thus you'll have the best chance to buy well below the cost of new construction in Tallahassee. If you are set on owning a new home, that's great, just make sure you go through the steps first so that you understand the new construction premium that you will be paying. The homes shown above are all the current new home for sale in the Tallahassee MLS. If you would like to see one, give us a call at (850) 366-8917 or drop us a note and we'll promptly make it happen!